pretty girls stillborn baby clothes for burial service born at 22 or 24 weeks in the most adorable fabrics. Soft and stretchy very comfortable. your baby girl will feel warm and settled fully dressed from top to toes as it a complete outfit. made form cosy jersey fabric hand made in uk by something precious tm. 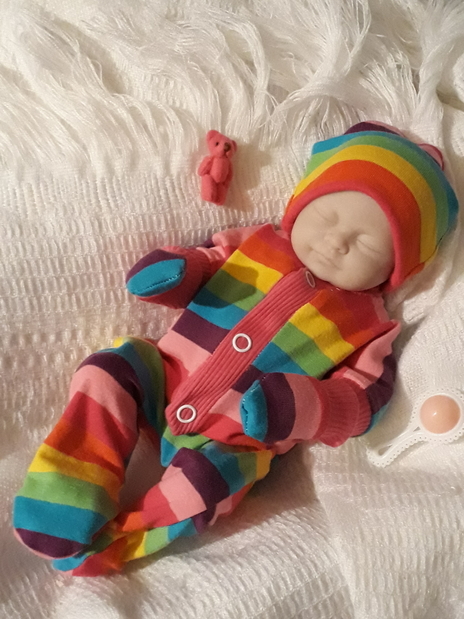 comes with all in one baby grow beanie and tiny mittens to match.click the order button just below to order this pretty candy rainbow outfit. also in boys too.